[PM2] Super Luigi的原文內容 - 瑪利歐世界 - 任天堂玩家網 - Powered by Discuz! Have you ever experienced a time when no matter how hard you tried, you failed, and the time you spent felt wasted? If ever you feel such pangs of regret, try to remember this tale...the story of a young man's quest to save a sweet princess. The day dawned like any other, but little did Luigi know the letter he was about to receive would forever change his destiny. "-Sir Luigi- Danger besets us on all sides, and we beg your help! The foul Chestnut King has stolen our treasure: our fair princess." The letter was from Minister Crepe of the Waffle Kingdom, a man aware of Luigi's many adventures. He knew only Luigi could save them. Charged with this dire task, Luigi wasted no time curtailing the heroic meal he was making. Then he packed for his deadly journey. Knowing that his older, though less talented, brother was out on a no-doubt inconsequential errand, Luigi took a moment to leave a note. "Mix a Keel Mango with a Peachy Peach to whip up a Fruit Parafait." These cryptic words were all Luigi wrote before leaving. Upon reaching the Waffle Kingdom, Luigi was greeted by pure misery, an endless flow of tears over the kidnapping of Princess Eclair. Arriving at the castle, Luigi was greeted by Minister Crepe, who carefully handed him a compass base with only one intact section. "Our land had a second treasure: the Marvelous Compass. Find its seven parts, and find Eclair." "It's a little warm," Luigi muttered, the sweat dripping from his brow as he followed the compass up Rumblebump Volcano's side. While Luigi had guts to spare, he did need a guide, and he found one in Blooey, a Blooper he met in town. Brave Blooey joined Luigi and instantly proved to be invaluable. With his aid, Luigi bested a savage statue that protected the treasure. That treasure was none other than a piece of the Marvelous Compass, a piece that pointed west to Plumpbelly Village. The second Luigi saw Plumpbelly Village, he knew something was amiss. All was woe, and Luigi soon learned the reason why from the mayor. The town was at the mercy of a sinister serpent, who demanded sacrificial lasses. Burning with indignation, Luigi formed a team of liberators. A fierce Bob-omb warrior named Jerry joined his crew and chose, not surprisingly, to stick with Luigi for the duration of his quest for Eclair. Fortified by his allies, Luigi strode on into the lair of the beast, a foul, two-headed snake. No time to think! Luigi sprang forth! Twin heads snapped at his heels, fangs dripping venom! Then, as one mouth gaped wide to swallow Luigi, the other crept behind... Our hero searched the treachery, and feinted before leaping! The heads collided, and the beast ate itself! The villagers begged their savior to stay with them, but a grim-faced Luigi pressed bravely onward. Dauntless Luigi's next test came in the form of a kart race on Circuit Break Island, where he won both the contest and a compass piece. The race was fraught with danger, but Luigi pressed through adversity to win! All viewers were awed by Luigi's revolutionary racing style. The mechanic who built Luigi's racing machine, a Buzzy Beetle named Torque, was so stunned by Luigi's race techniques that he joined him. Reinvigorated, Luigi set sail for Jazzafrazz Town, where he made his stage debut! Hayzee, a noted Dayzee producer, gave Luigi a key role. Playing the part of an earth spirit to pure perfection, Luigi stole the show. Hayzee's faith in Luigi's natural acting talents was rewarded. The performance won a prize, which yielded another compass piece. Hayzee turned from teacher to pupil, joining Luigi on his quest. It was at this time that Luigi's heart, usually draped in the cool comfort of a hero's resolve, began to warm with thoughts of Princess Eclair. This came to be because every time the magic compass pointed to a new place, her gentle words rang in her ears, touching him to his very soul. The voice spoke of eternity, of stars in the heavens. It wept for those blind to love. It gave comfort in the face of fear and loneliness. Though he had never seen her, our hero was tormented by visions of this fair-hearted maiden. All he could do was press onward. The compass pointed toward Rapturous Ruins. Footsore and weary, Luigi finally found the Rapturous Ruins beyond Grimble Forest. Within them, time and space were lost in nothingness. Within the pale emptiness, Luigi found a young sleeping boy. Our hero called out gently, and the youth woke from his long, long slumber. "My name is Cranberry, and I've waited for you for the last thousand years." The boy went on to tell Luigi the secret truths of an ancient land. He said that the Marvelous Compass had been created by the ancient Luff people, who used its powers of foretelling to rule the world. The survivors dismantled the compass and hid its pieces. Cranberry was the last of the ancient race. His role was to wait until one with a noble heart came to take the burden of the future. None but Luigi could have shouldered this weight. The boy gave him the compass piece, and said, "Fear the curse, but find your Eclair." 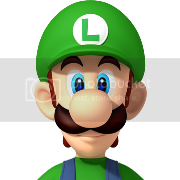 Luigi accepted the part, the boy's words burned into his brain. As Luigi gaped, both boy and ruins vanished, leaving our hero in a dark wood. With six of the parts united, the compass now pointed to the final part... To the quest's end... To Hatesong Tower. And then, her voice spoke... Princess Eclair's voice begged for help from the void, pleading for a hero. At long last, Luigi crossed the threshold of Hatesong Tower. "We will defeat the Chestnut King. We must!" Friends by his side, Luigi at last faced the fell Chestnut King...but then he heard a voice, and spun to see the fair Princess Eclair. At that moment, the villainous Crepe appeared. Hand it over, and the Luff empire will rule again! Luigi and Co. were no match for the might of Crepe, their true enemy. But then, the compass piece in Eclair's tiara shone forth! It bestowed the future-sight on Luigi! Knowing Crepe's every move, he smote the fiend with his mallet! And with that...it was finally over. Luigi and his friends parted, leaving the Waffle Kingdom in peace. Luigi went back to his humble home, which remained exactly as he had left it, a cold comfort for his heavy heart. Taking up a book he had been reading, Luigi tried to read, but his long trial had sapped his strength, and he soon fell asleep. Luigi dreamt of his friends and his beloved Princess Eclair. And sleeping, Luigi spoke... "I shall return." She told our hero the painful truth: the "evil" Chestnut King was actually her true love, made monstrous by Crepe in a bid for the throne.